Katsuyuki Motohiro is famous as a director and producer of live-action movies and TV dramas for Fuji Television. He made his directorial debut with Seventh of July, Sunny Day in 1996, then gained fame for his work on the hit police procedural TV series Bayside Shakedown in 1997. 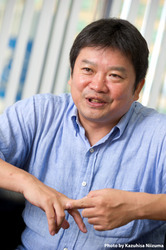 Afterward he went on to direct several theatrical releases and spinoffs, including Negotiator: Mashita Masayoshi and his most recent movie, Bayside Shakedown: THE FINAL in 2012. He is also known for UDON, a comedy movie. He fulfilled his dream of working on an anime by becoming the executive director of PSYCHO-PASS.